11 riders, including 2 new riders, departed Peckham Square just after 10am with Brockwell Park as the target. weather breezy but mild and no sign of sort-of forecast rain. Headed first west through the back streets to Benhill Rd. Turned south and uphill, climbing Camberwell Grove to Champion Hill. Then the reward, the lovely traffic free downhill on Greenway. Next a long run along Turney Rd, not diverting to nearby Dulwich Park or to Herne Hill Velodrome as we had visited these recently (28th Feb, see below). Had long wait to get across Norwood Rd and into the Brockwell Park owing to continuous traffic. Eventually a Tesco delivery van stopped and we could cross, A Tesco van also stopped for us on another recent ride, so maybe they are getting some cycle awareness training. Climbed the hill to Brockwell Hall and had a short break. Headed back through the park past the Lido (closed still) and then the pedestrian tunnel at Herne Hill Station. Back street route to Ruskin Park, then past Denmark Hill Station where Windsor Walk was closed to traffic due to building work. We could squeeze through on the pavement. An example of an accidental experiment with filtered permeability. Looks as though Windsor Walk could, without problems, be permanently closed to through motor traffic. Cold, grey, morning, threatening rain. But the 9 riders who braved the elements had only a few spots of rain during a bracing ride. Philippa led off for Nat Route 4 along the river westwards with Battersea Park as the target. Crossed the river at Westminster Bridge then past Parliament and first right to Gt College St and through Smith Square. Very hard to cross Horseferry Rd as traffic from direction of Lambeth Bridge was continuous. Eventually a motorcyclist stopped and let us across - really nice. And later on the ride a van stopped for us at another side-road crossing point. So an excellent morning for driver behaviour! Continued south past the back of Tate Britain and joined the Embankment just before the rail bridge into Victoria. From there over Chelsea Bridge and into Battersea Park for a warming drink at the La Gondola Cafe. Chaucer Drive, looking north. New raised table. Healthy Ride Report - Feb 21st 2015. Canada Water to Woolwich Arsenal. Leader Bruce. Only 3 riders, plus Bruce, for this ride. Dry and cold, but overnight rain had stopped. Met with Nigel's ride at Greenwich. They were just setting off in search of William Morris. Good to see some of our previous riders there - had wondered if the weather had put them off cycling! 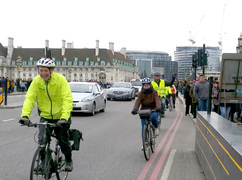 11 riders set out from Canada Water on a dry, overcast day with David leading. Followed a familiar route across Russia Woodland to the Thames path. Then through Deptford, across the new bridge and on to the Greenwich foot tunnel. Both lifts working so easily through the tunnel to the Isle of Dogs. Followed the north bank, around to Canary Wharf waterside, then through Wapping to Shadwell. At Shadwell chose the inland route along the canals to St Katherines and Tower Bridge. Back along Nat Route 4 south of the river to Canada Water. Brief stop at the Salter statues (see photo). Good ride, and back 10 min early! Route here. Beautiful sunny morning saw 15 riders gathered in Peckham Square. First stop was Telegraph Hill where the views were really clear after the overnight rain. Then north-west to Brookmill Park at the north end, but not before replacing an inner tube following a puncture. Short stop at the Visitor Centre next to Cutty Sark, then along the riverside to the new swing bridge over Deptford Creek. This is comfortably wide enough to share with the many pedestrians and other cyclists enjoying it. We rode across 3 times in order to get some photos. Back to Peckham via Edward St, Folkstone Gardens, Bridgehouse Meadows and Brimmington Park. Route at http://goo.gl/maps/GkEuB. This was a + ride, so 9.30 start. 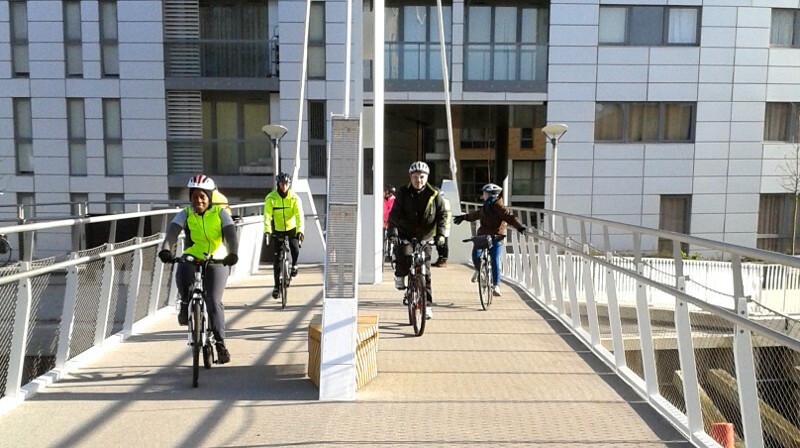 5 riders at Canada Water on a chilly morning. Boarded the 9.42 Overground train and were joined by one more rider at Surrey Quays. 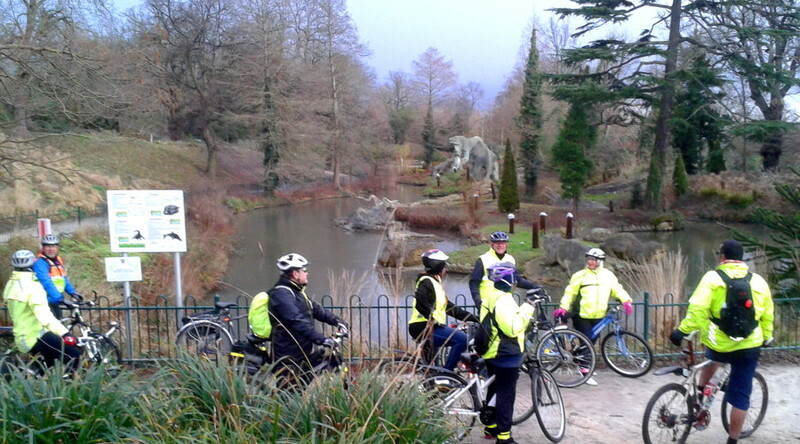 8 more riders were waiting at Crystal Palace, so 14 of us set off in light snow flurries for a circuit of the park. Snow did not last long, but there was plenty of ice. Having checked out the Dinosaurs, headed mostly by road to South Norwood Country Park via South Norwood Lake. At South Norwood Country Park we joined National Route 21, which was to be our course as far as the Thames at Deptford. Over the next stretch one rider punctured. Fortunately had a spare inner tube. But unfortunately that slowly went down. So she abandoned at Kent House station, opting to get a train home. Next Cator Park, notable for the small plaque commemorating Sustrans ?000 miles of cycle track. ?000 because plaque is in such a poor state it is unreadable. But the inscription from HG Wells “When I see a man on a bike I have hope for the human race" is still legible. Next a fairly uninspiring stretch to Bell Green. At this point the path becomes rather nice. But before heading on we had a bit of a discussion about time. By my estimation we were not going to get to Canada Water until 1.30 at the earliest. Taking our time in Crystal Palace Park plus the puncture had destroyed my estimates of likely progress. Everyone decided to stick together at least for the next stretch. Now on the Waterlink Way, following the Pool and Ravesbourne Rivers. This mile or so from Bell Green to Catford is one of the nicest off-road rides in London. And on a crisp January morning, really rather pleasant. At Catford negotiated the tunnel under the South Circular Road and the awkward barriers put up by the builders now converting the old Catford Stadium into housing, and into Ladywell Fields. Then at Ladywell Rd 2 riders headed directly home in the Nunhead direction. The rest of us pressed on through Lewisham and Brookmill Park to the Thames at Deptford Creek. Quick look at the new swing bridge (not open – but it is now – opened Monday 19th Jan), then along a familiar riverside route. Back at Canada Water at 1.30. So late – but no later than predected at half way.